If you have dreams of organized wrapping paper dancing in your head along with sugar plums, then this wrapping paper organizer cart will make all your Night before Christmas dreams come true! I know that I am going to cause all sorts of jealousy with what I'm going to tell you, but..Momma got a zippy new set of wheels! It has great cargo space and it comes in a fun and snappy candy apple red. 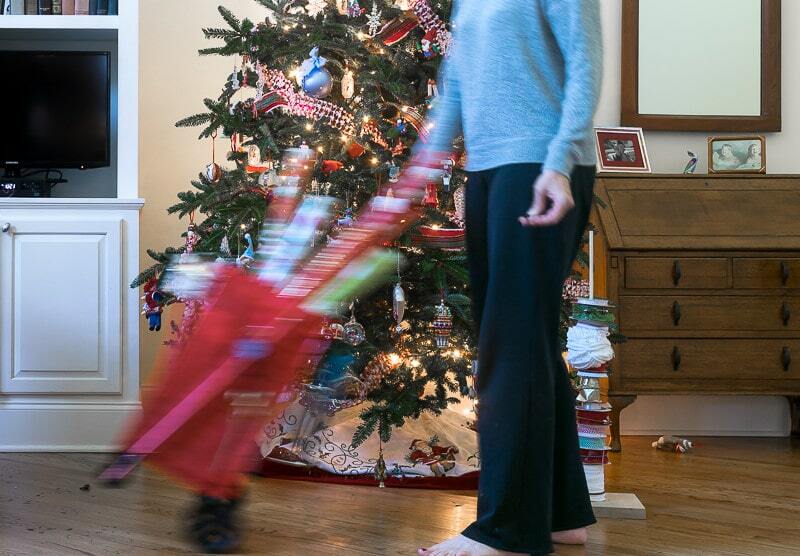 To this snappy little Wrapping Paper Organizer Cart. For MANY years, we dealt with a long narrow plastic box whose sole purpose was to keep and organize wrapping paper and wrapping necessities. It didn't do great at it's sole purpose and resulted in this year after year. There just wasn't a place for everything and an easy way to access everything. So I took matters into my own hands and designed a customized Wrapping Paper Organizer that was truly functional. I was inspired by CoCo's mobile wrapping cart a couple of years ago and finally took the time to noodle through what I needed. The paper stands up straight in the Wrapping Paper Organizer; you can easily see what you have and easily access what you need. I have all my gift bags tucked inside one larger gift bag inside the cart. while the cargo storage in the back holds folded sheets of tissue paper and a folder of gift tags and pens. But, perhaps the most cherished, invaluable, can't live without, rocks my world detail of my new Wrapping Paper Organizer is the retractable scissor holder! This little gem will stretch 4 feet to allow ample room for cutting paper, BUT will prevent the inevitable ‘disappearing scissors' phenomenon that occurred WHENEVER I would sit down to wrap gifts. I can't even tell you how much I'm loving my new wheels! Shockingly, I didn't have any of these things lying around the house so I did need to purchase everything. But you may already have some of these or might want to customize your cart to suit your wrapping needs. Folding Shopping Cart…this is the one I purchased. And as if my wrapping paper supplies weren't already organized enough…I put together this ribbon tower to corral all my spools of ribbon. Small bungee cords keep the ribbon neat. Do you have an organized Wrapping Paper setup? If you are thinking you would like to revisit this Wrapping Paper Organizer Cart then bookmark this page or pin this image. Thanks again for spending a few minutes of your busy day with me today.Please know that I welcome each and every comment that comes my way. If you want to make sure you don’t miss future content, pop your email in the beige box up on the right or click here. I usually send out 2-3 emails a week, so I won’t inundate your inbox…believe me, I’m sensitive to an overflowing email inbox! Fantastic idea to keep it all together . Would love to make one of these! Hey Barbara…I have always enjoyed gift wrapping, but not I am positively giddy because I can keep it neat and organized! This is too funny! I have a wrapping paper hoarding problem. I always buy it end of year on crazy clearance. Funny story when I move to this house someone had stuffed my wrapping paper into an upside down plant stand. I thought it was so genius I have kept it that way for years! Perfect solution!I’ll keep that one in mind too. I love how this organizes the paper, but what do you do with it for the other 50 weeks of the year. The advantage of the flat box is that it’s easy to store under a bed or on a high closet shelf. BTW, love the sight and just joined. Thanks Kirsten…I hear what you’re saying. Right now we have a large attic, so it’s really easy for me to wheel it in there for the other 11 months. But, we are looking to downsize and I think then I will use it year round, with all of my wrapping paper instead of just Christmas wrap. I am so glad to have you on board my friend. Best idea I have ever seen to store gift wrap! Like you did, I have the plastic storage box that never holds it all, then I have somewhere else for bows, then somewhere else for bags – – not to mention the scissor idea! I’m so excited, I can’t wait to try it. I’m going out tomorrow to get supplies. Aw, thanks Cindy! 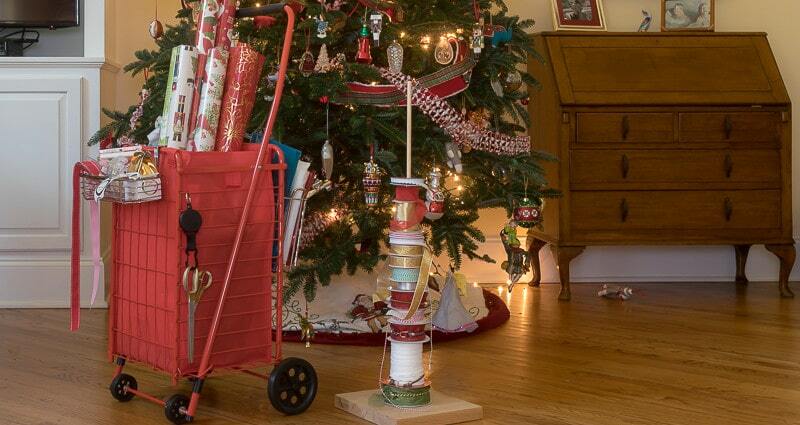 Have you put your wrapping paper cart together? I’m considering making a second one for the other 11 months of the year! Thanks for swinging by my friend.